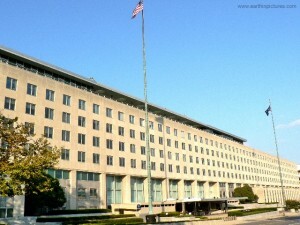 The State Department in Washington. The travelers less visible to Washingtonians are U.S. officials traveling across the country and around the world on official business, which means spending taxpayers’ money. The Bush administration decided about six years ago to allow business class airfare for federal employees whose one-way journey lasts 14 hours or more. But rising travel costs caused by a weak dollar and high oil prices put an end to that perk earlier this year. Even though hundreds of mostly Washington-based travelers have been feeling the difference for months, summer is the time when the most affected government travelers hit the road. Those are U.S. diplomats transferring from one post to another — often in different continents — with a lot of luggage and sometimes small children. Flying in coach with a family of four or five for 20 hours or more is certainly no fun. 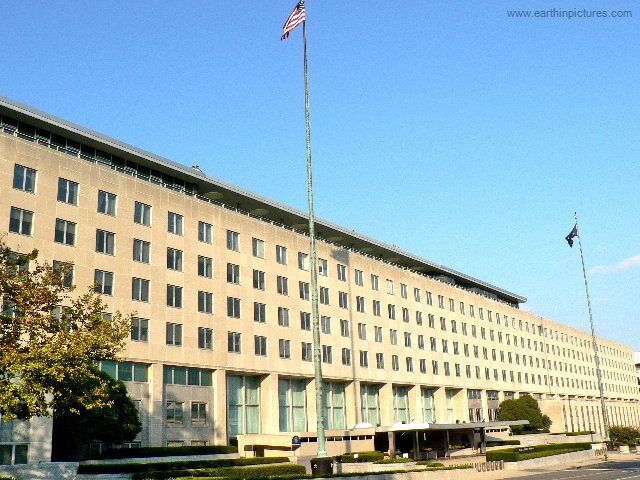 The State Department says it recognizes that but has to implement the decision of the Office of Management and Budget (OMB). At most U.S. embassies and consulates, tours last three years. The exceptions are the so-called hardship posts, such as Iraq, Afghanistan and Sudan, where assignments are for one year. Although the dollar has rallied and oil prices have plunged during the past few weeks, the coach-class rule is not expected to change any time soon, officials said. The State Department says it is trying to ease the burden on long-haul travelers by making sure they have enough time to rest after a long journey before reporting to work. Because federal employees are required to fly on U.S. carriers as far as they can before connecting to foreign airlines, their flights often involve two or three connections. A one-way trip from the United States to Southeast Asia, for example, can exceed 24 hours. Stopovers are not allowed unless the passenger covers the extra cost associated with them, including overnight accommodations. Last year, many in the Foreign Service were critical of some of their colleagues who spoke against the prospect of forced assignments in Iraq, saying the entire organization’s image suffered because of the public complaints. Every rule has exceptions, and you could still see passengers carrying those official black passports sitting in business class. The management of each government agency has the discretion to authorize premium travel on a case-by-case basis. Such circumstances usually occur when the traveling employees are required to start working soon after they land in a foreign country, without much time to rest. The most senior officials, such as agency heads and their deputies, also tend to sit in business class. And, of course, travelers can use their own miles or certificates to upgrade from coach. Those who stand to benefit from that option are mostly Washington-based frequent fliers with elite status and sizable mileage accounts. This entry was posted in Travel and tagged Afghanistan, Bush administration, business class, coach, diplomats, embassies, federal, flying, inauguration, Iraq, luggage, State Department, Sudan, Travel, Washington. Bookmark the permalink.